Once a Kemp Town house, before Whitbread took over and closed the brewery, the Eagle has been accustomed to makeovers throughout its existence. Whitbread transformed it into a Hogshead before these were established in larger buildings. An ex bank at the other end of Gildredge Road near Eastbourne station became the Hogshead and the Eagle retuned to ordinary Whitbread status. Later it became a Beer Engine before becoming just another Enterprise pub. Its latest transformation has been by far the best. Shoes Symes, landlady of the Greene King Dewdrop Inn just round the corner in South Street, became licensee earlier this year. After an excellent restoration job, picking out some of the original Kemp Town features, the pub reopened at the end of the summer. Shoes has used the Enterprise beer list in a most commendably imaginative way. CAMRA South East Sussex Branch was invited for an evening at the pub in mid September and members were delighted to find five local ales from Rother Valley, 1648 and Whites, plus real Old Rosie cider. Shoes’s generosity meant two halves on the house each plus some food. The pub has enhanced the rapidly improving real ale scene in Eastbourne and has become a regular drop in for local CAMRA members. It has also demonstrated the potential viability of a pub prepared to serve a quality real ale product, even with pubs around the country closing in numbers. Some CAMRA members worried that Shoes was being too ambitious, but are delighted to have been proved wrong! 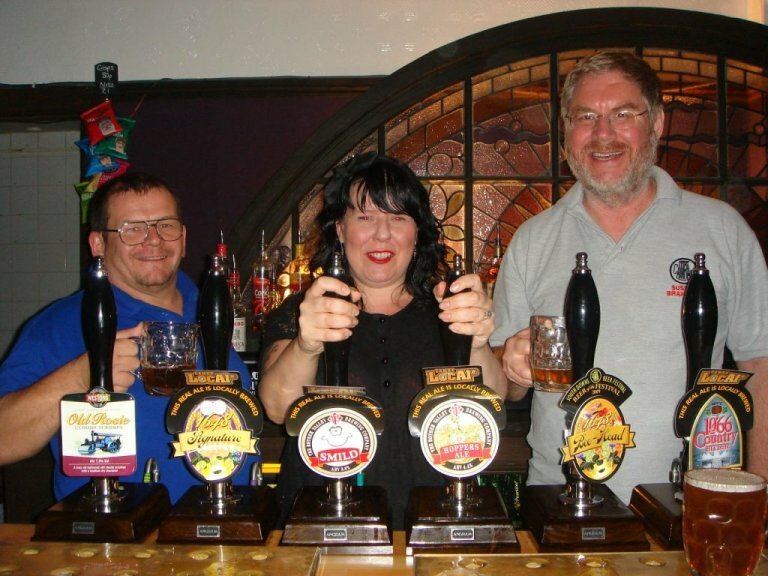 Picture left to right, Phil Cozens, (CAMRA South East Sussex Vice-Chairman), Shoes Symes, (Eagle Landlady) and Peter Page-Mitchell, (CAMRA South East Sussex Chairman).